Pre-gaming has a new meaning when it comes to Dribble Arena above Arbor Brewing Company. The rooftop football court is for you to hit up before (or even after) your drinking sesh with your squad. 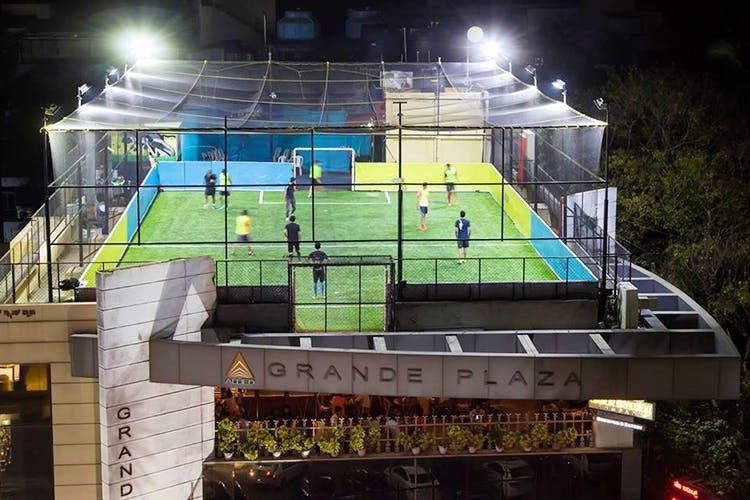 Dribble Arena's five-a-side rooftop football pitch is for all you footie fans who are looking for a more central arena to meet and play. Plus, the fact that it's above Arbor Brewing Company means after your game, the winners can be treated to a round of craft beer. And some of that sinful baked mac & cheese and potato skins with bacon bits. The football pitch is FIFA approved, so all you Lampards and Beckhams, rest assured that your game won't be hampered due to bad pitch conditions. Don't be a Neymar and roll around if you miss. If you are booking the evening slots (a maximum of two hours per booking), you get to play under floodlights. Don't worry about that Gerrard (he apparently he had a bad penalty conversion rate according to PL statistics) in your team who hits the ball to kingdom come. There are safety nets all around to keep the ball from flying off the pitch.Apart from using it as a football pitch, the multi-purpose court can also be used to pay cricket, ultimate frisbee, and kabbadi as well. Even though they say that they are open 24/7, we weren't able to book any slots beyond 2 am on their booking partner Playo. However, the first morning slot stars at 5 am. Do keep an eye out for the tournaments and events that they keep hosting, so that your team can take part in it.